Chicago (AFP) - LeBron James made a baseline jumper as time expired to lift the Cleveland Cavaliers to an 86-84 win over the Chicago Bulls in game four of the NBA playoff quarter-finals. Two-time finals MVP James caught an inbounds pass with 1.5 seconds left and drained a fadeaway shot from the left side with Jimmy Butler hounding him, to even the Eastern Conference series at two games apiece. Teammates mobbed James after he drilled the shot from 21 feet following a pass from Matthew Dellavedova. "He was in attack mode all night. 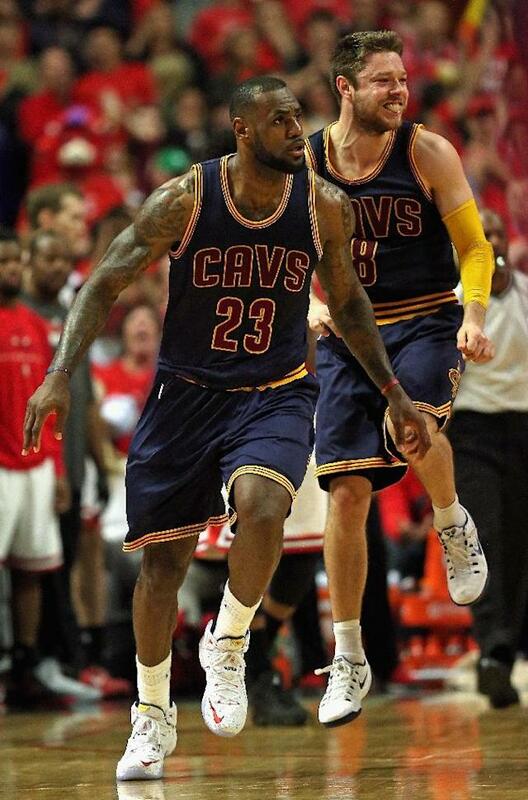 He took responsibility, and he led his guys," Cavaliers coach David Blatt said of James. In the Western Conference contest, DeAndre Jordan tallied 26 points and 17 rebounds as the Los Angeles Clippers put the Houston Rockets on the brink of elimination with a 128-95 win. James finished with 25 points, 14 rebounds and eight assists while center Timofey Mozgov contributed 15 points and nine rebounds in the win. Derrick Rose led the Bulls with 31 points and four assists. Guard Butler scored 19 points, and center Joakim Noah tallied eight points with 15 rebounds. Cleveland trailed by as many as 11 points in the second half before going on a 23-5 burst that made it 80-73 with just over four minutes left in the fourth. Guard J.R. Smith ignited the rally with a trio of baskets from beyond the arc early in the fourth quarter. James improvised on the game-winning play, telling Blatt to get him the ball and he would do the rest. "To be honest, the play that was drawn up, I scratched it," James said. "I told coach, 'Just get me the ball. We're either going to go into overtime, or I'm going to win it for us.' It was that simple." The shot marked the second straight buzzer-beater in the series. 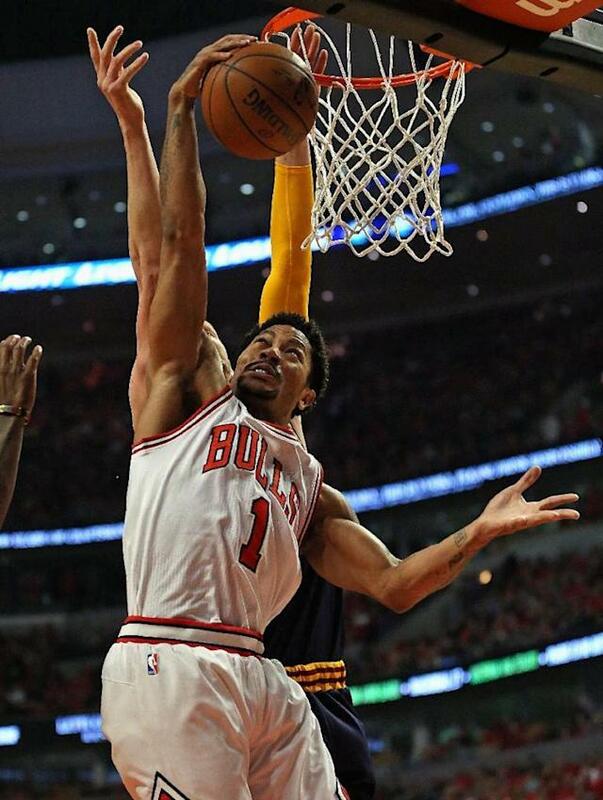 In game three, Rose banked in a three-pointer as time expired to win that contest for Chicago. Bulls coach Tom Thibodeau said back-to-back buzzer-beaters were an indication of just how close the two teams are. "(James) made a great play," Thibodeau said. "That's what great players do. 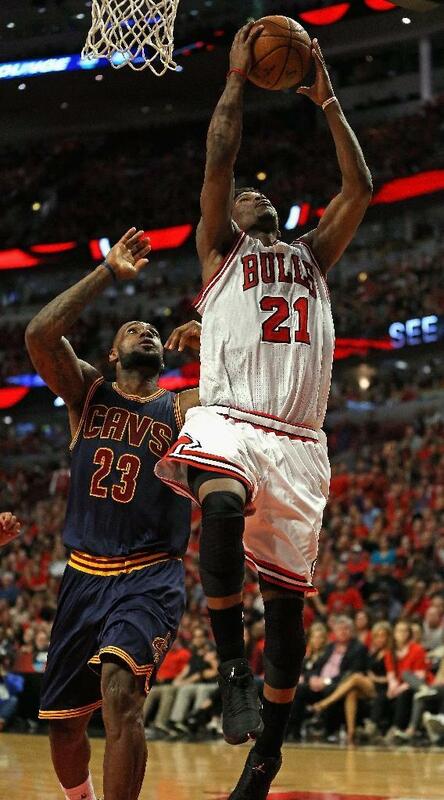 Derrick made a great play the other night, and LeBron made one tonight." James also had to do more than usual Sunday with Kyrie Irving hampered by a foot injury. Jordan finished six-of-seven from the field and 14-of-34 from the foul line for the Clippers, who took a 3-1 series lead and can advance to the next round with a victory Tuesday in Houston. The opening 24 minutes were sloppy and slow, with Jordan going to the foul line often. He sunk just 10-of-28 free throws and the Clippers shot a disappointing 24-of-44 from the line. Despite the poor free-throw shooting, the Clippers still led 60-54 at halftime and pulled away with a 21-4 surge to begin the third quarter.